Flowers and candy are nice but give mom or glamMOM a bit more thought this year with my fun and unique gift ideas. You might even want to give one to yourself. Serve her coffee or tea with a treat in bed! Then give her designer Jennifer Adams fabulous throws.This oh so soft throw feels and looks amazing allowing her to wrap her body in a bit of luxury. Jennifer Adams also has a line of gorgeous scented candles that smell divine. Ihave fallen in love with this wax candle collection.The scnet they named Ivy & lillies” is fabulous. www.jenniferadams.com or fine stores near you. Add a luxurious H2O + Spa Milk Collection with milk proteins,soothing botanicals and more and add a Replenishing Beauty Gelle by NeoCell and a Serenity eye mask and she’s all set. She’ll wake up rested and feeling beautiful. Who doesn’t love the gift of beauty? TemputAIR Makeup that you spray on! Airbrush makeup is all the rage. If she is a beauty junkie and loves to use what the makeup artist’s and celebrities use …this brand is it! Give her a Beauty to Go ala Hollywood style for touch ups and for travel. She can fill it with her fave products and enjoy the fabulous kit with mirror. Or how about a cook book called Tiny and FULL from a New York Times best seller Jorge Cruise. 50 Yummy and healthy recipes! A Madeleine Kit by Mastrad Paris for the woman or mom on the go who likes to whip up special things for her family and when entertaining friends.Gourmet made at home.OOH LA LA! Makes healthy popcorn without the bag in minutes in your microwave. I hope you enjoyed this guide and these tips. All you have to do is buy them,put a bow on them and give! To see me feature these on air visit http://www.firstcoastnews.com for video footage from the show. If you’re low on time and haven’t got a dime…send her a LOVE letter! OR make a greeting card from scratch. I’ve done both and they are easy to do and show your love for mom,your wife or grandma too. It is all about the little things,darlings! DO YOU LOVE all things LIPSTICK and more? I do too! I just discovered something awesome I had to share with you. 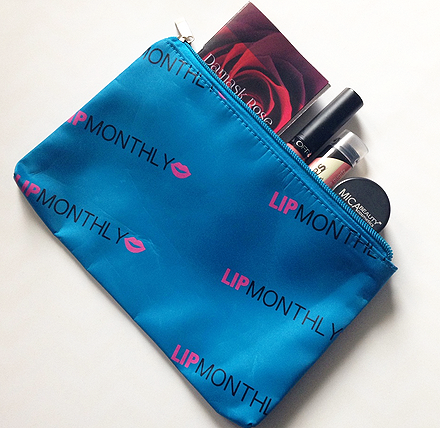 If you want to give another UNIQUE gift for St. VALENTINE’S day…Why not give your wife,daughter,sister,beauty junkie or BFF a subscription to LIP MONTHLY…. Delivered to her door! Give the gift of love and lips!